The Abbot Elementary School Ice Cream Social is Friday, May 30 from 5:30 to 8 p.m. This is one of the most popular events of the whole year as it is free and open to the public with a nominal charge for ice cream, food, games, the raffle, bounce house, and more. The money we raise from the Ice Cream Social helps fund field trips, school beautification, special assemblies and in-school events, supplies for teachers, and donations to community organizations that help our students, like the Peace Neighborhood Center. This year, we are doing a special fundraising challenge. Because the field trips this year to hear concerts at the University of Michigan were such a success and exposed our students to amazingly talented artists, like word-renowned Jazz musician Wynton Marsalis, we have budgeted money for all students in grades 3, 4 and 5 to go to a University Musical Society (UMS) performance next year. If we earn $1,000 above our goal for the Ice Cream Social this Friday, we will send an extra grade to a UMS performance. So please consider giving generously at this year's Ice Cream Social as it will directly impact our students in grades K-2 if we exceed our fundraising goal. Also this year we have a special guest. 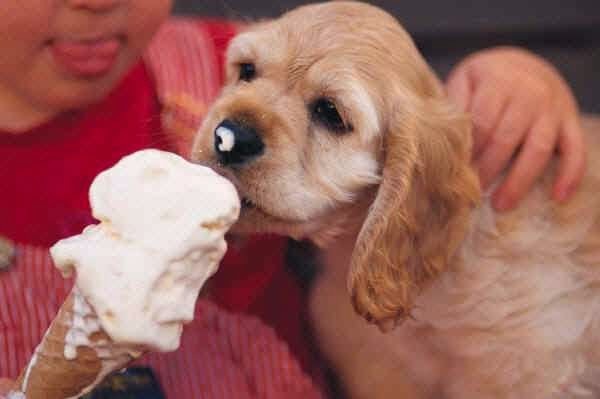 Detroit Tigers mascot PAWS will mingle and pose for pictures from 6 to 7 p.m. during the Ice Cream Social. abbotpto@gmail.com. We are especially in need of volunteers for the raffle and donations of cakes for the Cake Walk. Cakes should be dropped off in the office prior to the event and each person who donates a cake will receive a free raffle ticket. After the long hard winter, there was lots of cleanup to do in the Abbot Habitat last weekend. 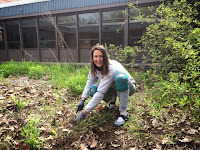 The Habitat is a special nature area in the shady area tucked behind our C and D Centrums (wings) of the school. 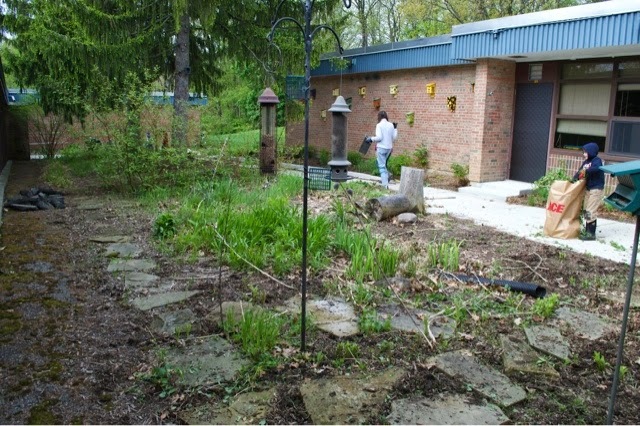 It includes native plants, feeding stations for birds and squirrels, and a miniature Ann Arbor bird house village. Abbot teachers use the Habitat to help educate students about science and the natural world around them. Tasks undertaken by our volunteers included weeding, removing dead foliage and making sure all the various plant species in the Habitat had come through the winter. Special credit goes to David Warner for the help with the pictures and for the project he is undertaking to identify the mystery plants in the Habitat. David even has plans to create educational signage for the more notable plants! Thank you to all the volunteers (kids and grownups) who gave the Habitat some much needed care! Our annual PTO volunteer appreciation breakfast is Friday, May 23, 2014, from 8:10 to 8:40 a.m. in the Abbot Library. If you've been a part of any of the following this year, please come and enjoy. And if you've not yet done anything this year, we still want you. Grab breakfast and then head outside to help out with Field Day, which starts immediately after the breakfast. The beautiful artworks we are using as the background for our blog were created by students in Mrs. Ruthven's art classes during the 2013-2014 school year. Under Mrs. Ruthven's instruction, students experimented with many types of art media, from the traditional paint and crayons to more unusual materials such as paper and yarn. They drew inspiration from both the natural world around them and from the works of famous artists Mrs. Ruthven introduced them to. 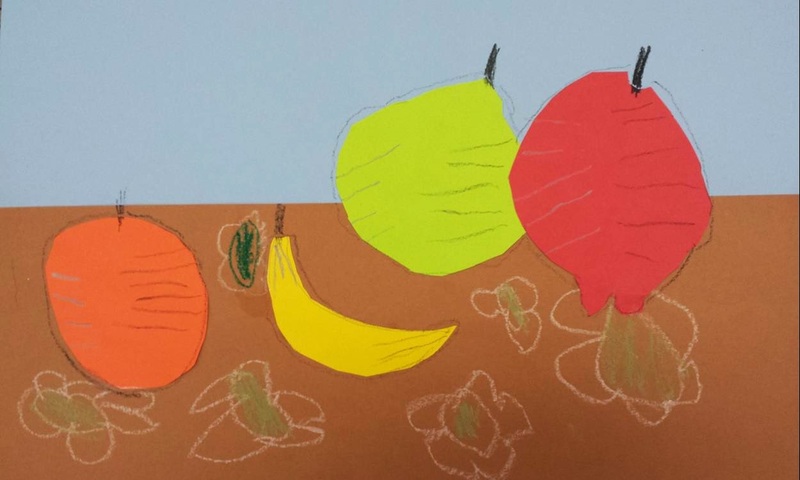 Just check out the Paul Cezanne-inspired fruit selection from one of the youngest artists featured on this page. More about our Abbot art classes can be found on Mrs. Ruthven's blog. Please note: Our blog is optimized for mobile device readers. If you are viewing this blog post on a smart phone or tablet, you may not see the background we're talking about. Click the "View web version" link at the bottom of the post to see the blog with its background artwork.